The crowd at Toronto's Sony Centre looked like an invading force of black-clad, illegible-logo-sporting Visigoths cheerfully intent on sacking the venue. The ushers in particular seemed unsure about exactly how to treat their audience, wearing dour and bemused expressions as they scurried up and down the aisles with tiny flashlights trying to ferret out the many sources of pot smoke. Ghost's set was brief, but demonstrated their continued evolution. During past performances, they placed emphasis of appearance and performance over the actual sound of their set. At the Sony Centre, the tables were turned: their dark-cathedral backdrop and set pieces had to share the stage with the other bands' equipment, including both full drum kits, making the stage cramped and ultimately detracted from the illusion of a menacing, vaulted space. However, Ghost stepped up to compensate. Vocalist Papa Emeritus was in fine form, his voice clarion clear, the tone supple and caressing, and positively soaring during set highlight "Prime Mover." Seeing them adapt to their surroundings went over well with the crowd, who warmly received their cheekily upbeat occult rock. Hearing Mastodon in this venue was revelatory, as the audience was able to appreciate the nuances of the instrumentation -- something that can be lost in a live venue. The bass lines were thick and languid one moment, throbbing and urgent the next, while the guitars were wielded like precision blades, sometimes barely nicking the listener, at other times gouging away. It was the drums, however, that were a highlight of aural pleasure, dynamic and muscular, play-fighting and then punishing. Mastodon played a great deal of material from their latest album, The Hunter (fitting, as this is the Heritage Hunter Tour), beginning with "Black Tongue" and closing on "The Sparrow." They did not ignore their back catalogue, though, and renditions of "Crack the Skye" and the monumental "Blood and Thunder" drew the greatest audience response. Adoring energy poured off the crowd, and Mastodon returned as much as they could, playing ferociously, but with perhaps the slightest tinge of weariness. Watching the Opeth banner being lifted, the crowd screamed again; they had became gluttons, shamelessly demanding more. Frontman Mikael Åkerfeldt was in fine form, his smooth baritone the perfect vehicle for his deadpan delivery. He openly discussed their choice of set list, revealing that the band were set on "force-feeding" the audience newer material because they liked it and were most excited by it. "Slither" (which they dedicated to Dio) pulsed and undulated, and "The Lines in My Hand" took on a swooping, spiralling ecstasy. The new material was also aided by the fact that the Sony Centre's wonderful sound supported their mix of delicacy and aggression flawlessly. It was the last two songs, however, that went over the best with the crowd: "The Grand Conjuration," during which Åkerfeldt employed harsh vocals for the first time in the set, and the tangled, choking beauty of "Deliverance." 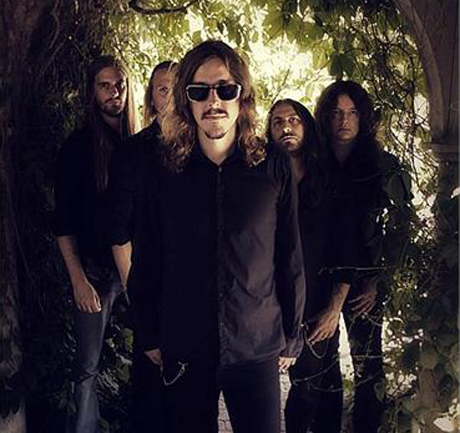 After bowing repeatedly, arms around each other like players in a theatre performance, Opeth were chased off the stage at 11 p.m. sharp. Despite being overwhelmed and filled to bursting, the crowd had become ravenous and still screamed for more.